If you are interested in learning more about caves, caving and cavers the best way to learn is to get involved. The CIG has many opportunities for every level of caver from beginner to expert. Feel free to introduce yourself to people at the meeting, ask questions or just go to the Contact page and fill out the contact form and send us your question. 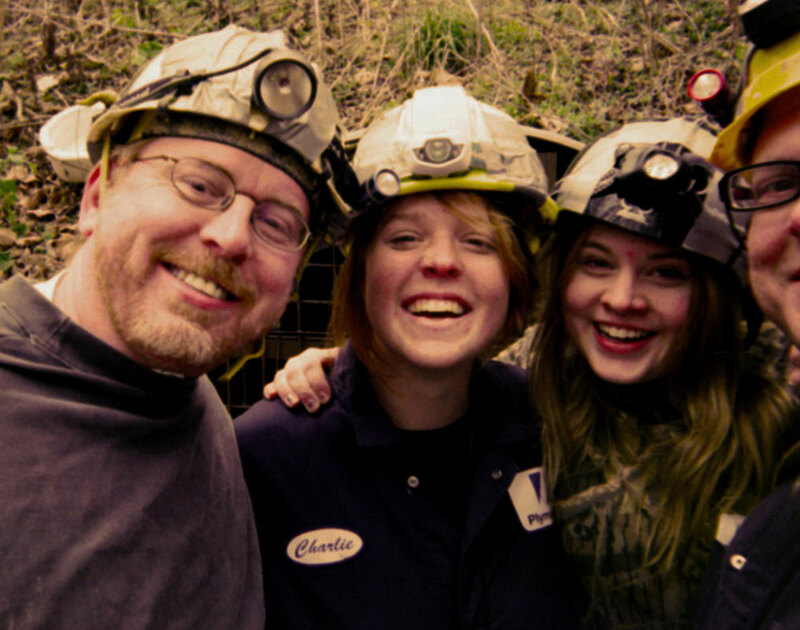 If you are interested in caving there are lots of opportunities for you to get involved with the CIG. Click on the titles below for just a few things to get you started. Whether you are an experienced caver new to the area, new to organized caving or someone just getting started, meeting other cavers is one of the biggest perks the Central Indiana Grotto has to offer. Our membership includes an unbelievable wealth of knowledge and skills. When you sit in a CIG meeting you may be sitting next to a pioneer that forged the way for caving in Indiana, someone who recently got back from dropping huge pits in Mexico, a biologist studying cave ecosystems, a mover and shaker in the caving scene nationally, a leader in the efforts for conservation of caves or someone who was on a surveying trip in Binkley cave last weekend. (the longest cave system in Indiana now approaching 40 miles in length!) The CIG is literally a goldmine of information, history and training and all just a conversation away. One fact with modern day caving is that the majority of caves in Indiana are now gated and managed by landowners or organizations in order to preserve the fragile ecosystems within and to protect the landowners from lawsuits and to control access to only properly prepared and responsible cavers. In addition to this, the newly introduced bat disease, White Nosed Syndrome (WNS), is taking it’s toll on the bat populations in Indiana resulting in all of the caves on publicly owned properties being closed. Getting to know other cavers and caving with them can help give you access to caves and the management systems in place and to build some pretty cool relationships along the way. You can only get so much information from surfing the web or reading books before you realize that the best way to learn about and experience caving is via other cavers. A great way to meet cavers starts at the Central Indiana Grotto monthly meeting. You can find out more information on the CIG monthly meeting page. The CIG hosts a variety of caving and Karst related events all throughout the year. A great place to begin getting acquainted with the Central Indiana Grotto is at the monthly cave trip. These are trips to caves usually in Southern Indiana. Many are suitable for beginners but some, especially vertical trips (requiring descending and climbing ropes) and wet trips (requiring a wet suit) may be more advanced and require special equipment and training. In the winter a vertical (rope) workshop is provided as well as a late winter ridge walk where you can learn more about karst geology and find caves. More about these monthly activities can be found on the Monthly Grotto Trips page. In the summer (sometime June – August) is the annual Cave Capers event hosted by the Central Indiana Grotto. Cave Capers is a caving mecca for those who enjoy the sport of caving in the Midwest and has now been taking place for 60 years! Capers is an entire weekend of camping, caving and eating taking place in Southern Indiana. 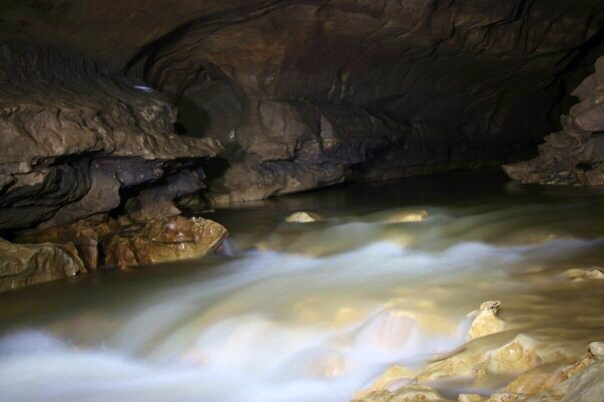 Enjoy led and self-led caving trips, campfires, live music and impromptu jam sessions, caving vendors and on Saturday evening a banquet with exceptional cave related programming. For more information on Cave Capers see the Cave Capers page. Whether you are just getting started or want to up your caving to another level the Central Indiana Grotto is here to help you achieve your goals! A monthly cave trip of beginners level is the perfect introduction to caving and a great opportunity to give caving a “test drive” to see if it is an activity you want to invest your time and money into. Caving is not an activity for everyone. Some people do not know until they crawl into a muddy cave that they can not cope with a confined space or the physical effort of dragging your body through mud and climbing over breakdown. On these trips you will learn about the proper equipment needed (and many times have the opportunity to borrow some of it) and be informed of safe and responsible caving techniques. Are you ready to take your caving up to the next level? Maybe vertical caving, surveying, conservation or leadership? Make sure to check out the vertical workshop in winter every year and inquire about the more advanced monthly trips. Get to know more experienced cavers and ask for advice on gear and techniques and you will find most are excited to help you. There are numerous CIG members that lead trips for scout and church organizations. You can volunteer to help on scout or grotto trips and there are always opportunities to become involved in Grotto activities presented at nearly every meeting from helping organize a yard sale to raise funds, helping in cleaning out a sink hole on Earth Day or design a t-shirt for cave capers.